Today's conversation takes place with textile designer and creator Emily Papuga, who incorporates the love of her home city into inventive, minimalist prints. Using famous places and spaces of Charleston as pattern references and inspiration, Emily created Suite 33 to bring home decor lovers both unique and handmade products-- ranging from shower curtains, to pillows...even cosmetic bags. So Emily, I found you while exploring the small business/creative scene here in Charleston—and was blown away by your work. Please introduce yourself and your craft. Thank you so much and yes, of course! I am a textile designer with a collection of prints and line of products inspired by Charleston. I use familiar places and pieces of the city, break them down to their basic elements, then make a pattern from the simple shapes. I design my textiles and produce my line of home decor and accessories from my workshop in Mount Pleasant. Was textile design always in the plan? Are there major decisions you made along the way that led you to where you are today? I first began my creative journey with my clothing line, designing dresses from causal to custom bridal. In the past couple years I have been approached to take on home decor projects and quickly grew to enjoy the process of creating items for the home to transform a space. I have since shifted my focus to home goods and working in the interior design field. When you first began your designing journey, what was your focus? Has your style changed? Reflecting on my very first prints, I think I have learned to be more inclusive with color and scale. 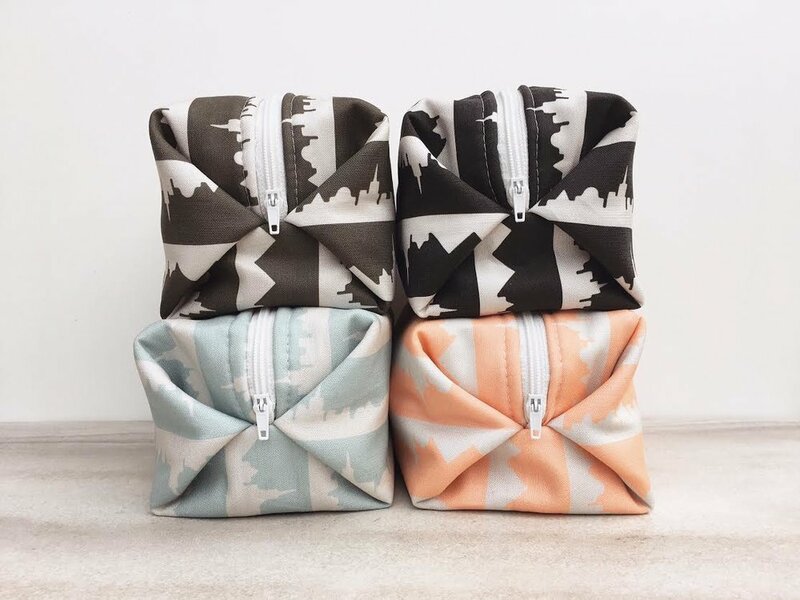 Certain color ways sell very well with my cosmetic cases but don't work as well for throw pillows or home decor and vice versa. For my home goods, I have been playing with prints in a larger scale to make a bigger statement and excited to soon share new projects! Is there a significance to the name, suite 33? Yes, when I decided to start my design career and first collection, Suite 33 was the address to my first studio/workspace downtown. Give us a little insight to your process. Where does each design begin? I like to use the Folly Pier print to describe my process, it was the start to my landmark pattern designs. Stumbling upon an aerial picture of the pier, I noticed the natural geometric shapes in it’s layout. Incorporating the tin roof shelters through out the structure naturally added interest to the design. From there, I began to think of other places around Charleston that would also make interesting patterns. Marion Square and Rainbow Row followed suit and the concept for the collection was born. Many of your designs are minimalist, modern versions of Charleston landmarks. How did these designs come to fruition? What inspires you to continue making them? I am easily inspired by our beautiful city and have many print ideas in the works, some very subtle. I look forward to introducing my Spring 2017 collection which is a Charleston botanical line, celebrating local foliage and historical gardens. I know from your website that you specifically use eco-friendly supplies for all of your products. Why was this a major business choice for you and your brand? I try to be environmentally conscious as much as I can and take pride in creating products using locally sourced materials. Has there been an “ah-ha!” moment for you when building your business/brand? Yes! I am looking forward to entering the bridal market working with Charleston brides on custom gift packages. I had a bride recently approach me for a set of cosmetic cases using my Magnolia print. She’s getting married at Magnolia Plantation and wanted something local and meaningful to share with her girls. I’ve noticed also that all of your products are made locally in the low-country. What has been your favorite local collaboration thus far? I am currently working on a photoshoot with a fellow local and friend, Erin Barrett of Sunwoven. Her overall aesthetic and attention to detail in both her home design and intricate weavings has been incredibly inspiring. I am hoping to build my brand recognition locally and to expand throughout the southeast to Charleston’s “sister cities”. With this being said, I would love to take more time this year to travel, gaining inspiration first hand. I am also looking to partner with interior designers on custom projects and styling. I am currently working with a textile rep who will be offering my fabrics by the yard to the trade and I am excited to see what doors this opportunity may open.